An SUV is not meant to outperform a supercar, but that's exactly what happened when the new Range Rover Sport SVR took on a fearsome mountain road in China. 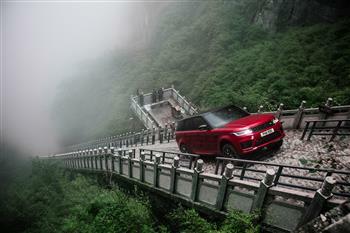 Land Rover's performance SUV, driven by Panasonic Jaguar Racing driver Ho-Pin Tung, has smashed the record for negotiating the 99 corners of the famous Tianmen Road. A dizzying 99 turns and 999 daunting steps didn't stop the new Range Rover Sport PHEV from completing a world-first at one of China's most famous landmarks. The petrol-electric performance SUV has become the first vehicle to climb the stairs to the natural rock arch of Heaven's Gate.